When Principal Lori Goslar asked if Read Better Be Better would like to have a visit from Governor Ducey, I immediately said — AFFIRMATIVE. There’s nothing a robot likes more than a like-minded human, and Governor Ducey’s push to showcase successful educational interventions in Arizona right now is exciting. This could not compute more! 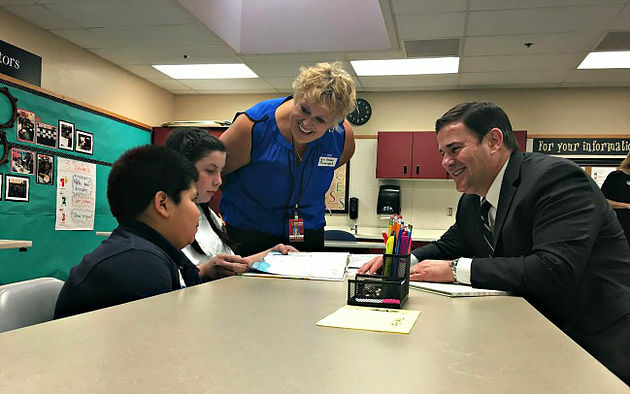 We were honored (and over-the-moon excited) that Governor Ducey selected the Read Better Be Better program at Michael Anderson-Avondale Elementary School for a visit in September 2016. A visit from the governor is a huge deal – and the children were both thrilled and nervous about the big day. To properly prepare, RBBB founder, Sophie Etchart, had a few press briefings, as well as some practice runs with the tiny humans in the program. The school even planted flowers, painted, and selected a new motto: Dream Big Work Hard. The day of the visit (September 20th, 2016) there was an electric anticipation in the air. 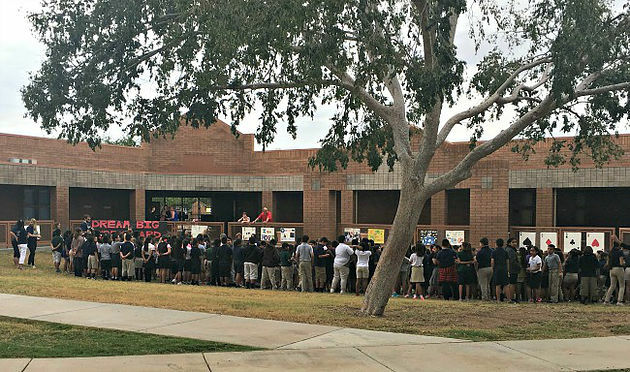 The kids were all taken out to a grassy area on the school grounds to see Governor Ducey arrive and they shouted their motto proudly. Governor Ducey then came into the classroom to talk to RBBB Bigs and Littles about their experience in the program. The Bigs were great at drawing out comments from some of the shyer Littles who were overwhelmed by the Governor’s visit. The leadership skills the Bigs have learned and honed during their time with RBBB were evident here – and we were all exceptionally proud of them! Governor Ducey made sure to sit at each table so he could get time with all the children. One Little told the Governor he never used to read at home because he didn’t like it, and now because of the RBBB program, he reads all the time. This was music to my audio interface! A Big also told Governor Ducey that after her experience with the RBBB program, she now wants to be a teacher. 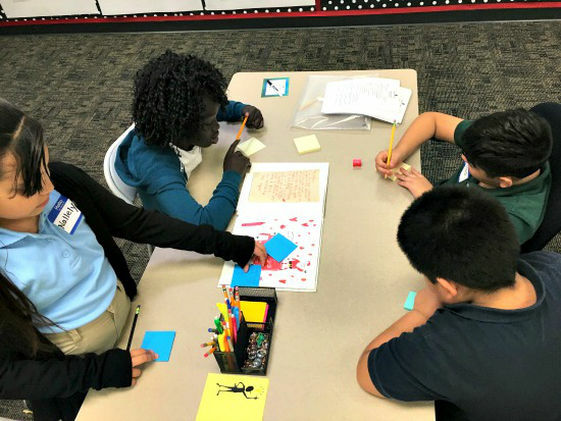 The children gave Governor Ducey a copy of the book, “The Day the Crayons Quit” by Drew Daywalt, that they had signed and annotated with Post-It Notes. When it was time to wrap up his visit, Governor Ducey spoke with Sophie about the barriers the children face and how RBBB is working to remedy them. 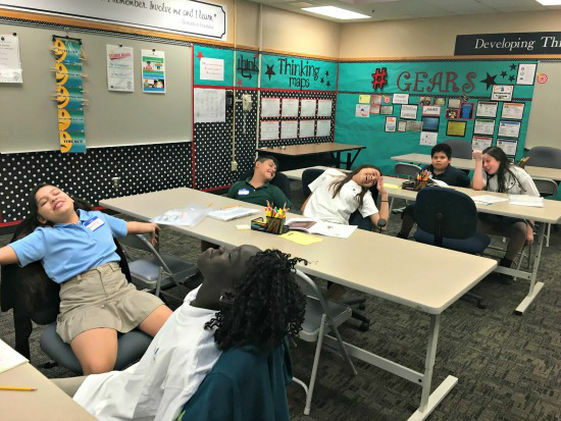 After the Governor’s visit came to an end, the children slumped over their desks in happy exhaustion. 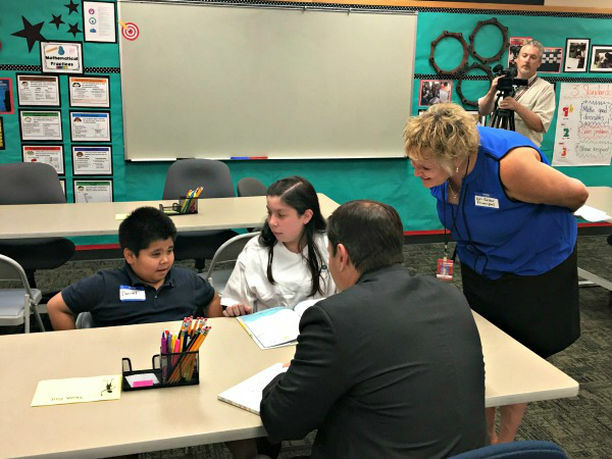 Governor Ducey’s visit was a special experience for the children. And it was a great honor for Michael Anderson-Avondale Elementary School to be selected as a shining example of growth, leadership, and commitment to improving early literacy skills. I would like to thank Governor Ducey, everyone at Michael Anderson-Avondale Elementary School, and all our wonderful Littles and Bigs, for a day we won’t soon forget. And, now, if you’ll excuse me, I need to go recharge my batteries.